Express franchisees and their staff members from the international staffing company took part in a raffle as well as silent and live auction fundraisers to benefit Children’s Miracle Network Hospitals. The company also announced the winners of The Impact Project, an initiative of the company’s philanthropic committee designed to give back to nonprofits nominated by franchisees among their more than 760 locations. The culture of Express is one of service, and our franchisees and their staff once again showed the heart they have for those in need. During its recent International Leadership Conference in Dallas, Express Employment Professionals and its franchisees showed their commitment to giving back to the community through donations to national and local nonprofit organizations. Express franchisees and their staff members raised more than $175,000 to benefit Children’s Miracle Network Hospitals (CMN Hospitals). Express has been a partner with CMN Hospitals for more than 20 years and has donated more than $4 million during that time. 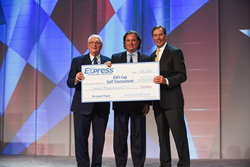 Express also announced the winners of The Impact Project, an initiative of the company’s philanthropic committee designed to give back to nonprofits nominated by franchisees among their more than 760 franchise locations. Ten nonprofits in Arkansas, Georgia, Michigan, Oregon, Washington, North Carolina, Colorado, Wisconsin, Utah and Minnesota received $75,000 in donations from Express. Kid’s Cup, a golf tournament supporting prenatal and infant care in Minnesota, was the grand prize winner, receiving a $20,000 donation. The fundraiser was founded by Mark and Sheryl Tasler, owners of the Rochester Express office, and has donated more than $1 million to the Mayo Clinic Children’s Center and the Olmsted Medical Center. For more information about Express Employment Professionals, visit ExpressPros.com. For more information about Children’s Miracle Network Hospitals, visit CMNhospitals.org.